In a measure of how the spring selling season has gone, June Existing Home Sales, a measure of contracts likely signed in March and April, totaled 4.77mm annualized, 130k below forecasts. It is the slowest since Nov. The drop in sales from May was all in the condos/co-ops category as single family sales were unchanged. Although unchanged in sales, single family months supply rose to 9.4 from 8.9, the highest since Nov as the absolute number of homes for sale rose. Months supply for condos/co-ops fell to a still elevated 10.2 from 10.9. The median home price rose .8%. The NAR chief economist said there was “an unusual spike in contract cancellations in the past month,” likely due to tough lending standards and appraisals below the agreed upon price. Also, the oncoming lower mortgage loan limits that FNM and FRE will be participating in are having an impact as some lenders are now only lending on the lessened amount, leaving a jumbo mortgage the only other option for some buyers, which is higher cost. 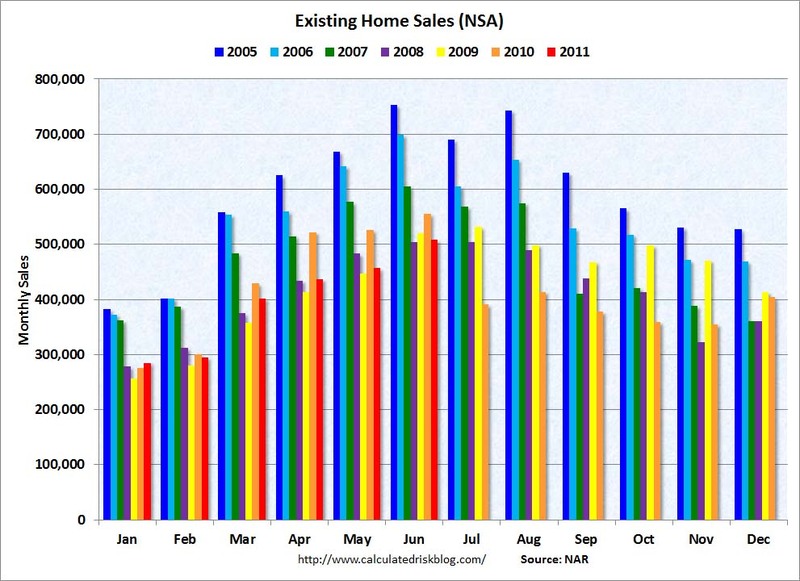 The NAR said 16% of contracts were canceled in June, up from just 4% in May. Distressed sales made up 30% of all sales vs 31% in May.